Wall Street has many proverbs that describe rookie investor mistakes. Famous last words of a rookie, for example, might be: “this time is different.” Or, for the rookie day trader: “trees don’t grow to the sky.” Or, one that might have saved a few tech fortunes that I know in the mid-1990s:“don’t confuse luck with smarts.” Each of these statements of Wall Street wisdom could easily apply also to the subject of human morality. 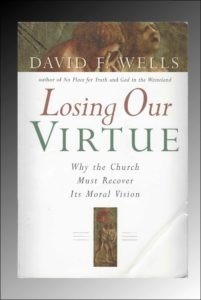 In part one of this review of David Wells’ book, Losing Our Virtue, I focused on summarizing Wells’ basic argument. In part two I examine his arguments in more depth. Addressing primarily an evangelical audience, Wells identifies two distinct contemporary spiritualities that both claim an evangelical heritage (belief in the Trinity, divinity of Christ, the resurrection, inspiration of scripture, and other core doctrines). In that sense, neither is generationally defined, but they differ in their response to postmodernism. In particular, in classical spiritualty, what is moral is central and in postmodern spirituality, it is not (34). The postmodern churches are counterculture being more therapeutic, more individualistic, and more anti-establishment (32). Where the classical spirituality focuses on God’s truth, the postmodern spirituality centers on God’s power; where the classical spirituality experiences God’s present through believing in his word and trusting in Christ’s work, the postmodern experiences God’s presence through the emotions and bodily actions—hands raised, swaying to the music, and release of pent up emotions (43). The postmodern piety has a mystical nature where God’s transcendent holiness cannot be experienced and parables, like the prodigal son, that presume the truth of sin seem almost inconceivable (45-49). This sense of shame accordingly comes across as been unworthy, unwanted, unclean, or just unlovable, and it masks the ability of many people to experience God’s grace. David Wells’ Losing Our Virtuefocuses on the question of Christian morality in the postmodern period better known for its sexual obsessions and liberality. As leaders in all aspects of society, from our politicians to our academics to entertainment to the church, crash and burn in moral failures in daily news accounts, Wells’ stark assessment of postmodern morality rings ever truer. This book desires another look from today’s academics and frontline pastors. Boorstin, Daniel J. 1962. The Image; or, What Happened to the American Dream. New York: Athemneum. Capps, Donald. 1993. The Depleted Self: Sin in a Narcissistic Age. Minneapolis: Fortress Press. Smedes, Lewis B. 1993. Shame and Grace: Healing the Shame We Don’t Deserve.New York: HarperCollins. Dennis Meredith.2018. The Neuromorrphs. Fallbrook, CA: Glyphus LLC. What does it mean to be human? What strengths and weaknesses does that imply? Raise your hand if you think you know! Dennis holds a B.S. degree in chemistry from the University of Texas (1968) and an M.S. in biochemistry and science writing from the University of Wisconsin (1970) and, in addition to being the author of several novels, works as a science communicator. Describes his novels as science thrillers, which includes: The Rainbow Virus, The Rainbow Virus, Wormholes: A Novel, Solomon’s Freedom, The Cerulean’s Secret, and The Happy Chip. Given his technical background, Dennis is a credible expert on advances the technologies involved in robotics and related software. The robots in this novel exhibit both neural network learning and a hive mind. Neural network learning focuses on pattern recognition. This could be taking a photograph of a person’s face and comparing it will a database of known faces or listening to a person speak and then writing out what they just said in complete grammatically correct sentences. A hive mind sounds exotic, but the neurons in the human brain form a hive mind. The robots in this novel communicate with one another routinely in making decisions, although the exact decision criteria are not given. Alpha robots get a greater weight the decision process, but the way this works is left to the imagination. Why the hive adds to the decisions of a single robot is unclear because they all share similar, but not exactly the same, software. Perhaps, the algorithms yield different results because individual robots experience different experiences that are themselves not shared. My nickname for a certain politician was “Robo-VP” because he spoke with relatively little emotion, as if he inhabited another planet. In this novel, the robots lack the emotional intelligence to distinguish subtle human emotions, jokes, puns, and sarcasm. Second or third level meanings would go undetected allowing humans under their control to speak truth to one another and not be understood by the robots. As such, it is unclear whether these neuromorphs could actually pass the Turing test. In order for the Neuomorphs to murder their human masters and loot their savings, their programs had to be altered to allow them to behave independently. This independence leads them to begin organizing as a group and to turn on the Russian mobsters and the programmers who set them free. This independence is ultimately their undoing as they insisted on greater independence, the characteristics programmed into them—the six deadly sins—also leads them to question and turn on their fellow robots. Dennis Meredith’s The Neuomorphsis a page turner with lots of technical details about robots and their software. Having spent a lot of years programming software, I found these technical details scary credible, adding to the suspense. Christian readers may flinch at the robots designed as mechanical prostitutes and the foul language used throughout the book. I accepted a free copy of this book from the author because the plot seemed compelling and I knew I had a week’s vacation coming up to read it. My kids have a hard time understanding first that today’s culture differs dramatically from the postwar culture that I knew growing up and that people actually enjoyed life back then. Life mostly revolved around family and church. Almost no one had psychological problems, although we all knew about battle fatigue, alcoholism, and suicide. Virtually everyone wanted the American dream and expected to participate in it. What we did not know what how fragile the economic assumptions were that allowed the American Dream to be a reality. In their book, Resident Aliens, Stanley Hauerwas and William H. Willimon (H&W) date the end of Christendom to 1963 when the blue laws in Greenville, South Carolina changed to allow the Fox Theater to open on Sunday (15). H&W have no interest in bemoaning or explaining the passing of Christendom and the American Dream, but rather focus on articulating what it means for the Christian church to delink itself from the cultural assimilation that began with Emperor Constantine’s Edict of Milan in AD 313 (17). Our task in the church is not to transform the Gospel for the world, but first to transform ourselves by being faithful to the Gospel (22). It is the world, not the Gospel, that is being transformed. Buying into Christendom may mean Sabbath rest on Sundays while businesses are closed, but at what cost? Not being willing to remain silent in the face of evil is in every generation a political decision. To do so as a group project is inherently political. These chapters are proceeded by a foreword and Preface, and followed by an Afterword and index. 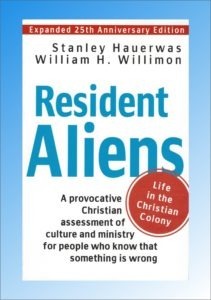 In Resident AliensStanley Hauerwas and William H. Willimon outline an approach to a post-Constantine church from perspective of the church and Christian ethics. The text is engaging and is often cited as a follow up to John Howard Joder’s The Politics of Jesus (Grand Rapids: Eerdmans, 1972), which they frequently cite.